The Philippines witnessed another pageant win at this year’s Miss Tourism World Intercontinental, which was held in Nanjing, China. On Tuesday evening, Filipino model and vlogger Francesca Taruc, 20, was crowned Miss Tourism World Intercontinental 2019. Tatarstan was the first runner-up, and Ukraine bagged the second runner-up title. Taruc hails from Pampanga. 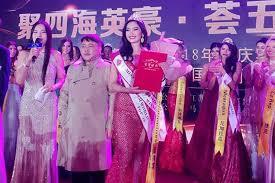 She received the Best Body award during the preliminary round of the pageant. In July last year, she represented the Philippines in Miss Freedom of the World 2018 held in Kosovo. Taruc’s win was the first pageant title for the Philippines this year and comes less than one month after Filipino-Australian Catriona Gray bagged the country’s fourth Miss Universe crown. Taruc graduated with a degree in Mass Communication at Holy Angel University in Pampanga. In an Instagram post, Taruc said that she can’t believe that she won the title and is honored to represent the Philippines in the pageant and bring home a victory. The beauty queen is set to return home today.